Wind generator vs solar panels. I will be on a mooring all summer with the catalina 250 on this inland lake near Montreal. So no real access to direct the hydro power plant generated electricity. Looking for both solar panels and wind generators, it seems that prices are dropping much this spring in Canada. My needs is mainly to be able to keep on charge optimally two 50 A/h batteries (I only have one now) and to have some light at the top of the mast at night. In addition, being able to use the starter on my honda 9.9 outboard, and feeding a 40 li Mobicool cooler would be great. I would like my batterie to be fully charge every second day. I have seen a Morphon wind turbine 400W DC 12 V with a 20A Hybrid Charge Controller for 220$ CAD. On the solar panels 100 W mono-crystal panel are available at 120$ CAD from Seacans. I thought that two of them with a charge controller would do the job. Given my type of needs would you say that either solution would fit my needs? Comments and and advices would be appreciated. Re: Wind generator vs solar panels. I suspect that you will get very little energy from wind in the Montreal area in summer. You will probably find that the cut-in speed of your wind generator is close to 10km/h and even at 16km/h output will be minimal. If it were me, I'd invest it all in solar. If you can't get your batteries fully charged every day, how do you expect to get them fully charged "every second day" ? if you don't have the money for more solar panels AND a wind generator sell the boat becasuse you will never have a solution . I would prefer to chew off my arm than have to listen to a wind generator all the time! It looks like wind is probably a poor choice for your area. Solar will take care of your anchor light and a bit more, but not a Mobicooler. They are thermoelectric and are notoriously inefficient. I did not see their technical specs on their web site, but they are probably quite capable of drawing your batteries down to zero over night. The problem with solar is cloudy days and shadows. You probably don't have room for more than 2 or 3 panels on 25 ft boat and one or more of them is likely to have a shadow over it at least part of the day which will really hurt your power production. 2 x 100W panels should give you 50+Ah per day in summer. Don't know about the actual power consumption of the Mobicool, but it is rated at 47W. Running on 12V it uses Peltier cooling - which is very inefficient. (Uses about 4 times the energy that conventional compressor coolers use for the same cooling). So I'd assume a very high duty cycle, especially during the day. Depending on a number of factors, the cooler may well need more than 50Ah per day itself. Any chance of fitting more solar? Two days being twice the time of a day, and not charging the batteries every second day, the sun or the wind will be going on these two days lap. But maybe this should not be written that way in Shakespeare`s tongue. Where did you get your data about Montreal? I get from 8 to 10 knots between may and september, that is 4.12 to 5.14 m/sec. On the lac des Deux montagnes, west of Montreal, the wind conditions might be a little different than in town. But maybe you know better. -For whatever combination of reasons, very very few people seem to find that wind is superior to solar in terms of producing electricity. -Consider using one MPPT per each solar panel if you decide on solar panels to maximize solar capture. Victron makes a MPPT that costs about $120 US each. There is a lot written on this subject in this and other forums. -If pull-starting the outboard is not an option, consider carrying a little battery to/from shore to charge at home for starting purposes. I don't know any better, never having been there, but I find WorldWeatherOnline to be a useful tool for places I've never visited. I just worked on the premise that conditions on the lake would be similar to the published Montreal data. That said, even 8-10 knots probably won't give you much energy. 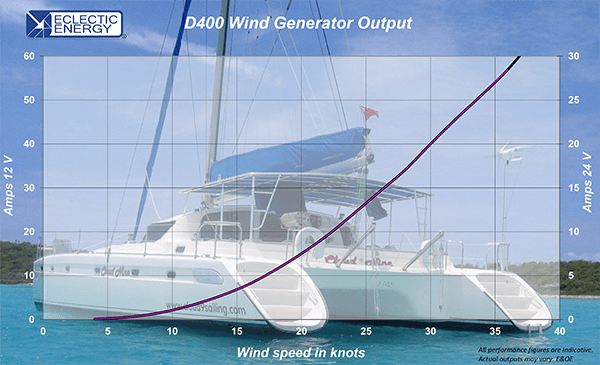 The D400 that I am familiar with is generally rated to be one of the best at lower wind speed and that only gives a couple of amps at 10 knots. The curve for any 400W turbine will be similar, but generally lower. It took me time to post and already a few of you have written after the first intervener. 1) This is not a question of one or the other. I just thought that 200 W could charge a 50 Ah within about five hours, based on some calculations on the net. Maybe, I miscalculated. Though I know that getting a battery fully charged should take more time. 2) I do not mind adding panels or using both wind generator and solar panels. The limitation would be more in terms of our Montreal area available winds. 4) Sentinel at night electric consumption, could there be low consuming bulbs? 5) Thanks for the tip on the Peltier system, I did not knew that is was less efficient than conventional compressor. What formula did you used to calculate the power consumption of the Peltier system? In addition, I might need the cooler only for outings, as I will not live on the boat. So lets says not more than five hours. Does the device consume less energy for cooling only, and not freezing? Cooling would be enough for me. Exclude the cooler and the only think you need is 100 watt solar . If you need a cooler if better to use one with compressor it will be more efficient though power hungry . I now have total 200 watt and batteries are full every day even with autopilot running the victron controller is at float . I did had a wind generator it was silent but the dump load resistor was noisy so I have it for sale . I do t have a fridge . Ps : I tried water cooled peltier , and was very inefficient. If you have the budget to buy one (around 450 complete kit ) I think 200 watt solar will be able to run a compressor . I suggest you get only solar panels. Where you are in summer you will have a lot of daylight hours but not enough wind to generate much useful power. Wind generators are terrible in a lot more ways than solar panels. I am wondering what you would use a cooler for. Isn't the water already cold enough? Can't you just stick whatever in dry bag and hang it under the boat? I like both myself. We have 300 watts of solar and a Rutland 913 wind generator on our 32 foot yacht. The wind generator does not produce much power but on more than one occasion I have gone to bed and woken in the morning to fully charged batteries. A wind generator does not take up much room and its always good to have more than one source of power. 5) Thanks for the tip on the Peltier system, I did not knew that is was less efficient than conventional compressor. "In refrigeration applications, thermoelectric junctions have about 1/4th the efficiency compared to conventional means (they offer around 10–15% efficiency of the ideal Carnot cycle refrigerator, compared with 40–60% achieved by conventional compression-cycle systems (reverse Rankine systems using compression/expansion". What formula did you used to calculate the power consumption of the Peltier system? Quoted 12V DC input for various Mobicool x40 models is around 4 Amps according to specs I've seen. That's 48Ah per day. We had a similar cooler on a 30fter and it never did get things really cool in 30°C ambient temperatures. It basically had to run constantly. In addition, I might need the cooler only for outings, as I will not live on the boat. So lets says not more than five hours. Does the device consume less energy for cooling only, and not freezing? Cooling would be enough for me. Cooling is all you can get from a Peltier system. In practice, they are often only good for keeping things cool, not getting them cool . And you really need to make sure that whatever you put in it is already fairly cold.